Pioneers in the industry, we offer semi automatic bottling machine, mineral water bottling plant and automatic bottling machine from India. 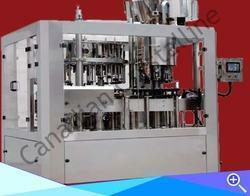 We offer 5 gallon bottling plants, which is manufactured using state-of-the-art technology. The CC 1000 PLC series consists of 1 BPM to 25 BPM range, which has been specifically manufactured for 10 to 25 liters polycarbonate/PET. Bottles are fed to bottle holders, which tilt the bottle on top of high pressure spray which washes the bottle in 3 stages. The bottles are cleaned in the first stage with hot water detergent (temperature ranging from 55 0 C to 80 0 C), wherein the second and third stage these bottles are cleaned with ozone rise water with a concentration of 0.4 to 1 ppm of ozone. 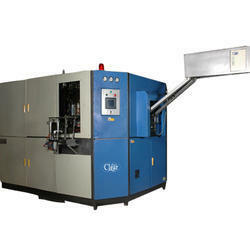 The machine has Angular Spray for external wash of the bottle and after the cleaning stage, the bottles are put on the filling conveyor. However the complete system is enclosed in a stainless steel/glass outer casing, after which the bottle are automatically ejected out to the output conveyor. 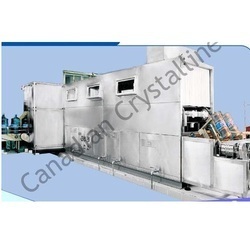 We are a leading manufacturer of a complete range of Mineral Water Bottling Plant under one roof on turn key basis. Critically proven for glass bottles and Pet bottles.